Criminalize Conservatism: Where Have The Blue Dogs Gone? Where Have The Blue Dogs Gone? 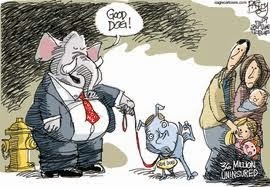 Today's post, a reprint of an article by "Skaje" at Dailykos.com, "Where Have The Blue Dogs Gone? (And What It Means For The Democratic Party's Future. 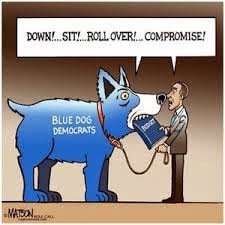 )," is a summary of the present decaying state of the Blue Dog Democrats (http://en.wikipedia.org/wiki/Blue_Dog_Coalition). "Following the 2008 elections, congressional Democrats entered a historic session, controlling the House 257 to 178. However, those days were marked by sharp divisions in the Democratic caucus. The conservative wing of the party, primarily associated with the Blue Dog Coalition, opposed many top progressive initiatives, from healthcare to financial reform and everything in between. "Nevertheless, the 2010 GOP wave hit the Blue Dogs and their fellow travelers the hardest as their conservative districts turned on them anyway. 2012 saw further losses for them (despite Democrats actually netting eight seats overall), as gerrymandering, retirements, and increased polarization took their toll. 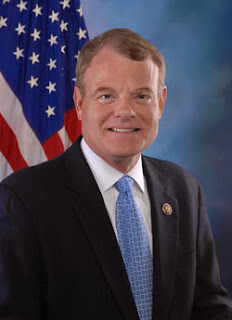 As we head toward the 2014 elections, two of the most prominent and conservative Blue Dogs remaining like Jim Matheson (D-UT) and Mike McIntyre (D-NC) have announced their retirements, and the once powerful caucus seems destined for irrelevance. Affordable Care Act (Obamacare): Just four of the original 34 Dem "no" votes (Barrow, Lipinski, Lynch, Peterson). House stimulus package: Two of the 11 (Cooper, Peterson). Cap and Trade: Seven of the 44 (Barrow, Costa, DeFazio, Foster, Kirkpatrick, Rahall, Visclosky). Dodd-Frank financial reform: Five of 27 (Cuellar, Kirkpatrick, Kaptur, Schrader, Visclosky). Repeal of Don't Ask, Don't Tell: Two of 15 (Peterson, Rahall). DREAM Act: Nine of 38 (Barrow, Higgins, Kaptur, Lipinski, Owens, Peterson, Rahall, Schrader, Visclosky). Abortion-related Stupak Amendment to Obamacare: Fourteen of a disappointingly high 64 at the time (Barrow, Bishop (GA), Cooper, Costa, Cuellar, Doyle, Kaptur, Langevin, Lipinski, Lynch, Neal, Peterson, Rahall, Ryan). "Head below the fold to learn more about what this means for the Democratic Party's future. 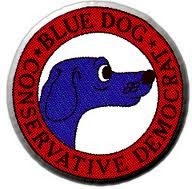 Blue Dog Coalition membership: Only 12 left from their height of 54 members in 2009 (Barrow, Bishop (GA), Cooper, Costa, Cuellar, Gallego, Lipinski, Peterson, Sanchez (Loretta), Schrader, Scott (GA), Thompson (CA)). "It may appear that I'm cheering the demise of the conservative wing of the party. While replacing conservaDems in safely blue seats would obviously be helpful, there just aren't many people left like Dan Lipinski (D-IL), who persists in voting to the right of his solidly Democratic district. The unfortunate fact is that most of the Blue Dogs held deep red seats, and they've been replaced by far worse Republicans, which cost us control of the House in 2010. "The point, rather, is that this trend can't be halted or reversed. While we could hold down deeply conservative seats in the past with veteran incumbents and pick up red seats with locally popular and moderate challengers, those days are behind us. Even as we picked up seats in 2012, the conservative caucus suffered further losses, and the few new Blue Dog candidates went mostly nowhere. Matheson and McIntyre hold down the reddest seats of any Democrat, and it is not a coincidence that they are the only House Democrats to retire for reasons unrelated to health so far this cycle. "But it's not all bad news. As this phenomenon changes the makeup of the Democratic caucus, a parallel one is affecting Republicans. Witness their marquee retirements this cycle: Tom Latham (R-IA), Jon Runyan (R-NJ), Frank Wolf (R-VA), Jim Gerlach (R-PA). It's no coincidence that they are among the Republicans who occupy the bluest districts. Over the past several cycles, even during the GOP wave of 2010, Republicans have shed their most moderate members in blue seats via defeat or retirement. Their loss is our gain, and we have managed to elect mainstream liberal Democrats in their seats. These seats are also much easier to defend than Blue Dog districts, are more durable against waves, and lead to a more cohesive caucus. "The congressional maps are still severely gerrymandered against us on the whole, but with this realignment in mind, we know where the next Democratic majority will come from. And when it does arrive, it will look much more progressive than the last one." 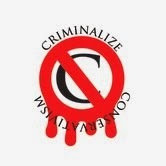 (ORIGINALLY POSTED TO SKAJE ON FRI JAN 10, 2014 AT 07:09 AM PST. Many of us won't forget the 34 votes against the Affordable Care Act, the antics of Max Bachus that helped gut the Act, and the destruction wrought against the Democrats by the likes of Joe Lieberman, Blanche Lincoln, and Gary Condit. 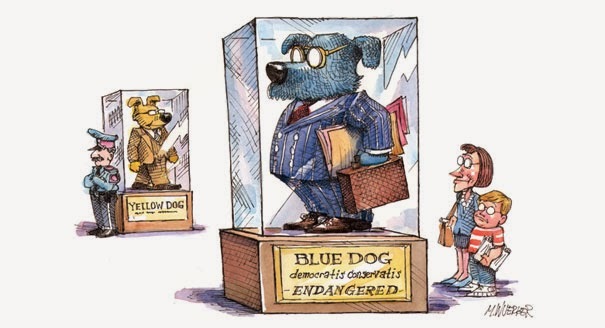 Will the passing of the Blue Dog Conservative DINOs finally usher in an age of progressive politics for America? Not without a lot of hard work and money, and even though the Blue Dogs held many of their seats in Red districts, at least we'll finally see each politicians' true colors - Blue or Red - and hopefully with a majority in Congress. The premise of this site, that Conservatives are a vast criminal enterprise hiding under the tent of the GOP, will still hold. If Progressives are finally able to retake control of the three branches of government, we will gladly shut down the site and stand back and watch the country's return to democracy.